The UN human rights chief has described the campaign of violence by security forces in Myanmar against the Rohingya as a “textbook example of ethnic cleansing.” Today’s Europe-Asia Meeting of foreign ministers in Myanmar is a critical opportunity for the EU to press for stricter sanctions, support access for the Human Rights Council’s Fact-Finding Mission, urge Myanmar to work with Bangladesh and the UN to allow the voluntary return of refugees, and secure humanitarian aid for the more than 600,000 Rohingya refugees who have fled to Bangladesh, as well as those who remain in Rakhine State. Independent Diplomat is advising Rohingya representatives on their diplomacy at the UN Security Council and European Union. 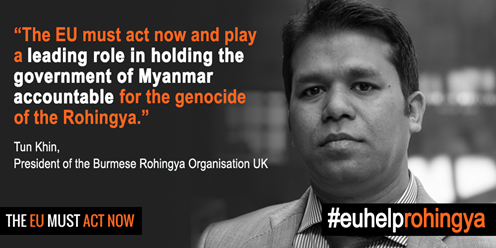 On 21 November, please join us in Brussels as we co-host an event at the European Parliament on the Rohingya crisis (click for details).